Use your choice of vegetables including parsnips, potatoes, celeriac, red onions and beets or go with all orange and yellow as given in the recipe. Looks as good as it tastes. From Bonnie Stern's Essentials of Home Cooking. Combine the prepared vegetables in a large bowl and toss with oil. Spread onto a large non-stick rimmed baking sheet. Use parchment paper if you like, but I didn't find it necessary. Roast at 375 degrees for 45 to 60 minutes, stirring once or twice, until browned and tender. 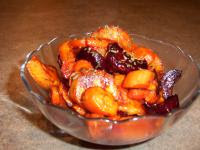 Combine the vinegars and remaining ingredients in a small bowl and toss with the hot, cooked vegetables. Sprinkle with parsley.